Southwest Airlines has long been seen as the leader of the U.S. airline industry, especially from an investor perspective. The company recently reported its 40th consecutive year of profitability; no other airline comes close to it in this regard. It is also the only major airline with an investment grade credit rating, due to its manageable debt levels. While Southwest's stock performance over the past decade has been unsatisfactory -- particularly compared to one of the new disruptive forces in the industry, Allegiant Travel -- shareholders have not lost much money. The same cannot be said for Southwest's "legacy" competitors, most of which have gone to bankruptcy court within the last 10 years. However, Delta Air Lines now appears to be assuming Southwest's leadership mantle within the industry. Whereas Southwest was once a pioneer in initiatives such as fuel hedging, now Delta is becoming the leader in "best practices" such as disciplined capital spending and capital return. If Delta can maintain this position, shareholders will continue to profit. One of the biggest innovations introduced by Delta is the purchase and upkeep of used aircraft in lieu of expensive new airplanes. Northwest had adopted this strategy prior to its merger with Delta five years ago, and Allegiant has also followed this practice for more than a decade. New aircraft are very expensive, and are long-lived assets. When buying a new plane, an airline needs to be confident that it will be able to deploy it profitably for 25 years! In the fast-moving airline industry, it's impossible to project business conditions that far in the future. If industry changes require downsizing, a company with lots of brand-new planes would be at a disadvantage and could be forced to write down the value of those assets. Buying used aircraft -- and keeping old planes flying longer -- can help avoid this problem. If industry conditions demand downsizing, it's easy to retire an old plane that is already fully paid for. Furthermore, as new generations of airplane technology are introduced, used aircraft prices for the prior generation tend to drop dramatically. Delta has taken advantage of this logic by buying dozens of used MD-90 jets, which were built in the late 1990s. The slight fuel efficiency advantage of current-production aircraft is easily outweighed by the lower cost of used MD-90s. A similar thought process motivated Delta's decision to lease 88 Boeing 717s after Southwest decided to phase out that model at its AirTran subsidiary. Delta's frugal capital spending has allowed it to quickly reduce its debt burden while maintaining a competitive product. It is also enabling Delta to return capital to shareholders. Last week, Delta announced a new $0.06 quarterly dividend and a $500 million share repurchase plan. This week, Southwest took a page out of Delta's book. On Wednesday, the company announced that it would purchase 10 used Boeing 737s (which are coming from WestJet) in 2014 and 2015. At the same time, Southwest deferred orders for some new Boeing 737s scheduled for delivery in the next five years. These moves will reduce capital spending by $500 million over the next five years. 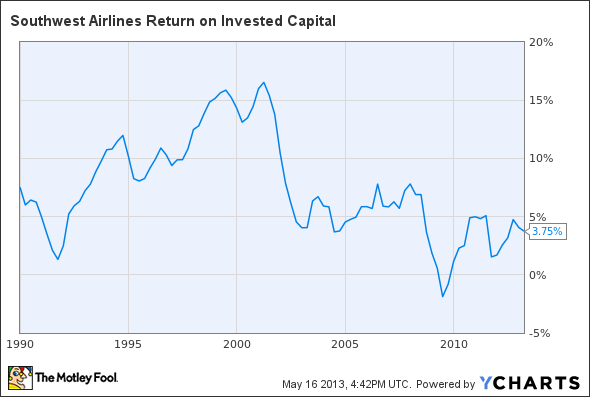 This in turn will help Southwest improve its return on invested capital, which has suffered recently. Southwest's decision to follow Delta's example by buying used planes rather than relying entirely on new aircraft is also freeing up more cash for shareholders. Southwest announced this week that it is raising its quarterly dividend from $0.01 to $0.04 and increasing its share buyback program by $500 million. Thus, Southwest has found Delta's used aircraft strategy to be equally rewarding for shareholders. Delta has become an industry leader in recent years by thinking outside of the box. This has led to initiatives such as its capital allocation strategy and its decision to buy an oil refinery. Delta's forward thinking has left even longtime industry darling Southwest as a "follower". So far, Delta's unique strategies have been very prescient. If the company can maintain its leadership position in terms of these "new" initiatives, Delta should continue to be a rewarding investment. Solid companies selling at depressed prices have consistently helped generations of the world's most successful investors preserve capital, minimize risk, and achieve long-term, market-trampling returns. For one such company, read our free report: "The 1 Remarkable Stock to Own Now." Just click here to get started. The article Southwest Passes the Leadership Torch to Delta originally appeared on Fool.com. Motley Fool contributor Adam Levine-Weinberg has no position in any stocks mentioned. 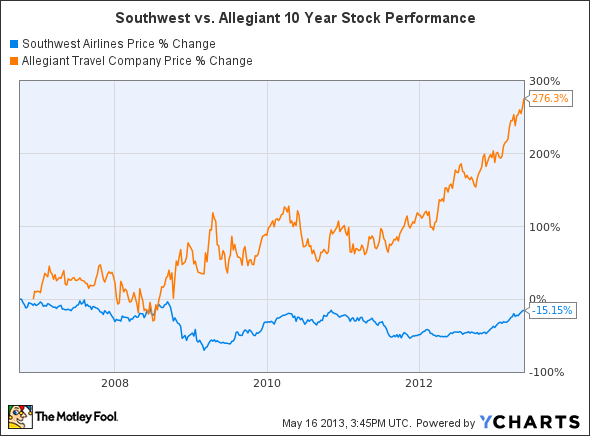 The Motley Fool recommends Southwest Airlines. Try any of our Foolish newsletter services free for 30 days. We Fools may not all hold the same opinions, but we all believe that considering a diverse range of insights makes us better investors. The Motley Fool has a disclosure policy.